As we reported last year, a regional 511 trip-planning website — along with phone service — has been under development. It’s still not fully baked, but has come far enough along that transit officials in Southern California are officially launching the service this Monday. The Go511 website is still in its test phase — it’s actually online now — and officials are hoping for feedback from the public; I’m particularly interested in how the trip planner works. A mobile site still needs to be developed. 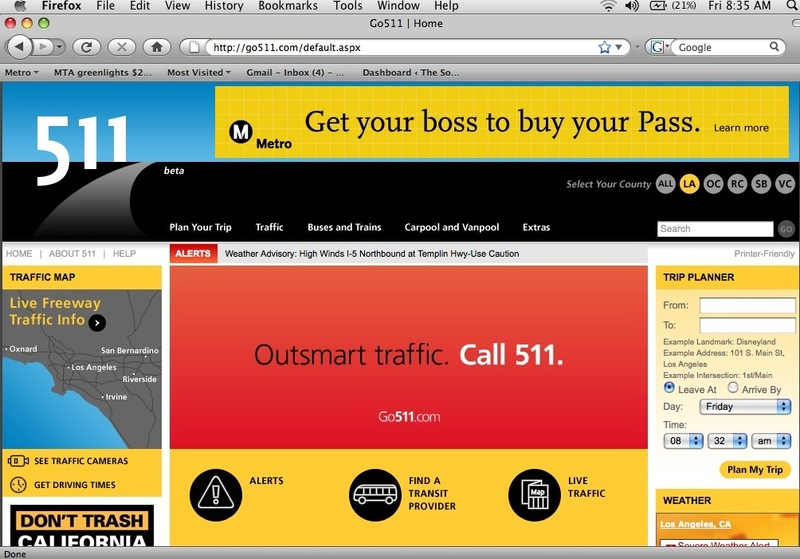 Attentive readers will recall that Los Angeles Mayor Antonio Villaraigosa recently introduced a motion asking for a true regional trip planner and it will be interesting to see if the new Go511 website fits the bill. There are links to other transit agency websites and there’s also traffic and vanpool information. By means of comparison, here’s a link to the San Francisco region’s 511 website, which has a good mobile site. Transportation officials from Metro, Orange and Ventura counties joined Caltrans and CHP today in introducing a new automated toll-free phone and Internet service that provides 24/7 on demand updates on traffic, trip planning for public transit or connections with car or vanpools throughout Southern California. The service, which debuts Monday, June 14, also offers extras like bike information, links to area airports and taxi services, even the latest local weather reports. Commuters can simply call 511 or visit Go511.com to get help with their travel in Los Angeles, Orange and Ventura counties. On the Internet, traffic and travel information for these counties as well as neighboring San Bernardino and Riverside counties is available. The 511 phone and internet service is being fine-tuned and new features such as making it accessible on mobile devices and the ability to handle Spanish voice prompts will be added in coming months. The service will debut in a test mode so that the public can give feedback to further improve 511. Both the phone and the Internet connections have prompts for feedback. 511 is the three digit number synonymous with travel information. That number can be called in cities and counties throughout the United States for local traffic and related information. Callers will be given automated voice prompts to access the information they need. 511 traveler information services are provided by the Los Angeles County Service Authority for Freeway Emergencies (LA SAFE), in partnership with Metro, the Orange County Transportation Authority, Ventura County Transportation Commission, the California Highway Patrol (CHP) and Caltrans. In Los Angeles County, Metro will also keep the 1 (800) COMMUTE phone number where the public can speak to a live operator weekdays from 6:30 a.m. to 7 p.m. and weekends from 8 a.m. to 4:30 p.m. Operators speak English and Spanish.